With a light bite feeling, we are the lightly-salted. 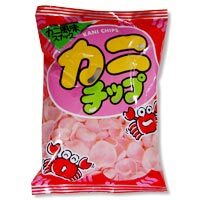 "A flavor of a crab" which opens in a mouth faintly. We finish eating just one bag when we begin to eat. It is a cake with taste. It is discussed the rights and wrongs of by tidbits.